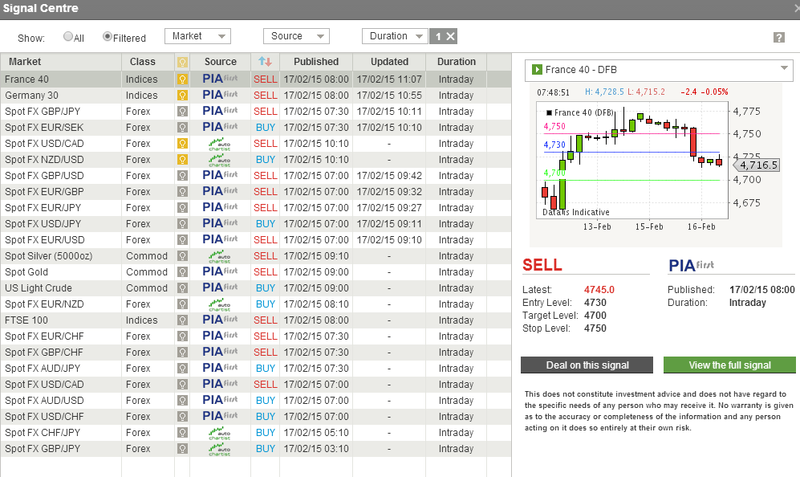 IG – often regarded as one of the best spread betting brokers has increased it’s added value offering again. The spread betting giant has always been an excellent source of added value tools for their customers and show no sign of slowing down. IG recently launched a discounted stock broking service so customers could use equities as collateral for spread betting. Their insight research and sentiment platforms gives a good overview of fundamental and technical data and information on charts. The sentiment screens show whether other clients are long or short a specific index, stock or FX pair. What Signal Centre does is aggregate the trading signals from various providers like Trading Central, Auto Chartist and PIA First. It’s a nice screen to have open and shows trades that can be filtered by time scale such as intra-day, short, medium and long term. It does’t just say buy or sell, but rather gives entry points at which a trade would become appealing. This should help with your spread betting strategy.